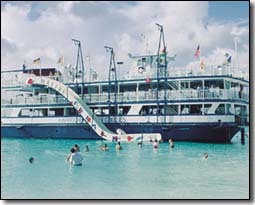 The MV HARBOUR MASTER Cruises in Barbados is a custom built floating entertainment centre. 100 feet long, 40 feet wide and 4 decks high equipped with beach landing facilities and featuring the longest floating bar in the Caribbean, plus air-conditioned restrooms with hot and cold fresh water showers. Find more Boat Trips & Sea Tours in Barbados! Send Harbour Master Cruises Postcard to a friend!